MLG was created in 2002 by DiGiovanni and Mike Sepso, borne from their own competitiveness playing Halo against each other. The pair put up their own money to finance the tournament at a LAN center in New York City in late 2003. It didn't quite go as planned, but some of the players who attended stuck around and helped the brand grow. The second event, held in Philadelphia in early 2004, was a lot bigger and much more of a success. That's where players that are still on the MLG Pro Tour now first got their start with MLG, players such as Tom "Ogre 2" Ryan and Dave "Walshy" Walsh, who had already been making a name for himself in professional gaming. "My first [competitive gaming] event was in 2002. I went with a few of my high school buddies, drove down during Spring Break," says Walshy when asked about the first time he played games for money. "I took 5th place in the free-for-all tournament, but my teammates didn't do so well. I won about 50 bucks and just continued from there." Out of the 50 MLG tournaments that have been held since then, Walshy has been at close to 45 of them, including every event from 2006 until now. "This has all come from a grassroots organization. At the first events I went to, I had to bring my [game] disc, sign it in and make sure I got it back at the end. It was more about the pride back then. It's gotten a lot bigger, got some sponsors. It's really blowing up," Walshy says. What about the competition? Is it hard to stay frosty? "Absolutely, the pool of talent is just so much larger," he says before he smiles. "I hate it, man. 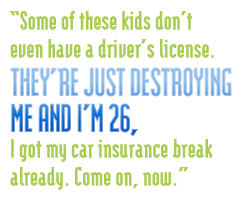 Some of these kids don't even have a driver's license. They're just destroying me and I'm 26, I got my car insurance break already. Come on, now." The personalities of players like Walshy are a big reason that MLG is still around and earning a profit when so many other gaming leagues have either folded or fallen from prominence. In 2008, the Cyberathlete Professional League cancelled the remaining events on its tour due to the costs of running its tournaments. Under new Asian owners, the CPL plans to open again soon but it is a far cry from the heyday of the 2005 World Tour, which made Jonathan Wendel (Fatal1ty) a household name. (Or at least a name which emblazons mouse pads at your local Best Buy.) Other leagues and championships have done well internationally, such as the Korean World Cyber Games which models itself after the Olympics, but MLG is in the spotlight here in the US with recent coverage on ESPN.